Valerijans Dadžāns was born on February 11, 1932, in Abrene district, Viļaka civil parish, he died on March 25, 2012, in Jelgava. In 1953, he graduated from the Faculty of History at Latvian State University. Since 1953, he had been a teacher at Atašiene secondary school, Vircava secondary school, Jelgava boarding-school, at school in Jugla sanatorium; he had been a research associate of a former Revolution Museum (at present – Latvia’s War Museum). He was a self-taught painter and had studied painting also privately. He also was a metal craftsman and stage designer in Jelgava music school. From 1965 he began participating in exhibitions. His solo exhibitions have been held in the gallery “Jāņa sēta”, Riga (1993), Ģ. Eliass Jelgava History and Art Museum (1993, 2002), J. Čakste museum “Auči” (2000, 2001 2002), in Stuttgart, Germany, (1994), in Nashville gallery, USA, (2002). The memorial exhibition was held in Ģ. Eliass Jelgava History and Art museum and in the gallery “Antonija”, Riga (2013). He was a member of Jelgava Artists Association since 2009. Valerijans Dadžāns (1932 – 2012) from Jelgava is an autodidact, who parallel to his work as a teacher selflessly devoted himself to painting. Painting was his “promised land” where he could occupy his mind and express himself. He painted for his own sake, and had to be talked into participating in exhibitions. 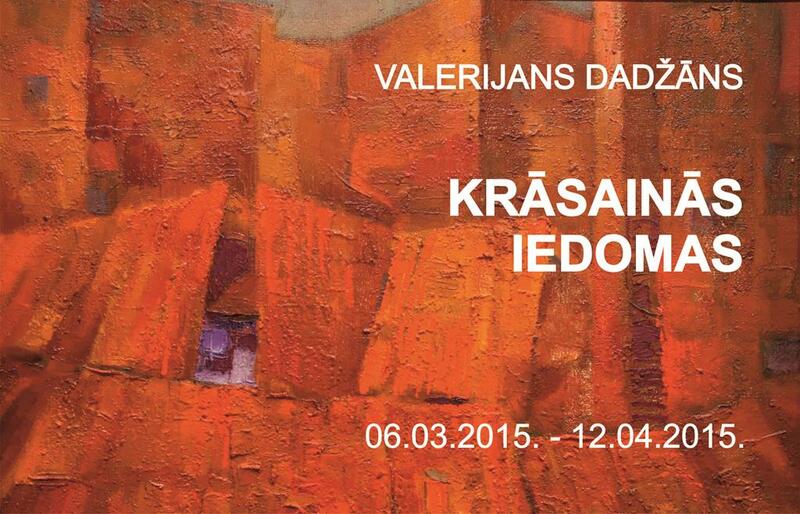 The teachers of Valerijans Dadžāns were the artists he encountered during his lifetime: Imants Blakenburgs, Kurts Fridrihsons, Jānis Pauļuks, as well as books. Though initially his works were characterized by a realistic world portrayal, soon he got attracted by modern world art, which we feel echoed in his pictures. Although the artist was a personality of great integrity, Valerijans Dadžāns’ style, personal manner of painting are not easy to define: he relied on feelings he experienced in everyday life, on images which emerged in his mind, on reflections which enhanced his creativity. The artist created his own laws and exposed to them the compositions of his pictures. To diversify the texture and enrich his collage works he used fabrics, ropes and other materials. To more perfectly and accurately express the world of his fantasies he gladly lived in, he played with colors, fields, rhythms. Frequently, through the images he had created, Valerijans Dadžāns tried to make some philosophical and allegoric generalizations about his reflections on the world and what is going on in it today.